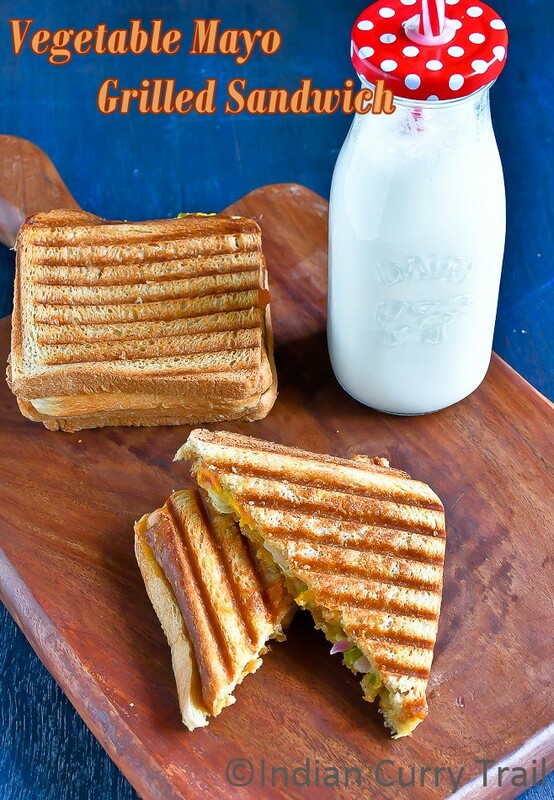 Mixed vegetable Mayo sandwich is an easy to make breakfast or snack and one of the best ways to feed vegetables to kids. The vegetables can be customized according to personal need. It also perfectly fits for kid's lunchbox. 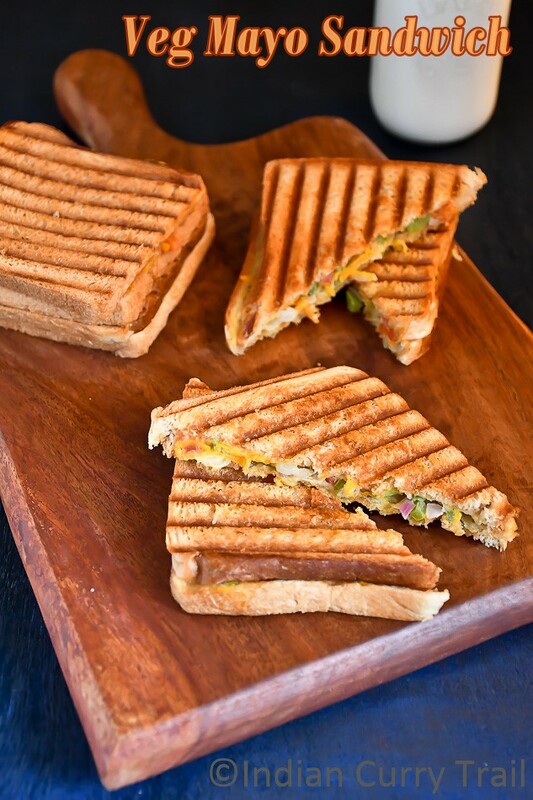 This easy sandwich can also be made using stove top method. The video recipe is given below. Please subscribe Indian Curry Trail YouTube Channel for more videos. 1) In a mixing bowl, mix onion, tomato, capsicum, carrot, lettuce, green chilli and mayonnaise. 3) Mix well using a spatula. 4) Coat the bread slices using butter. 5) Take approximately a tablespoon of the vegetable mixer, place it over one bread and cover it using the other bread slice. 6) Coat the grill using cooking oil and pre-heat it. 7) when the grill is ready, place the bread and keep it for 5 minutes or until the bread slice become nice brown. 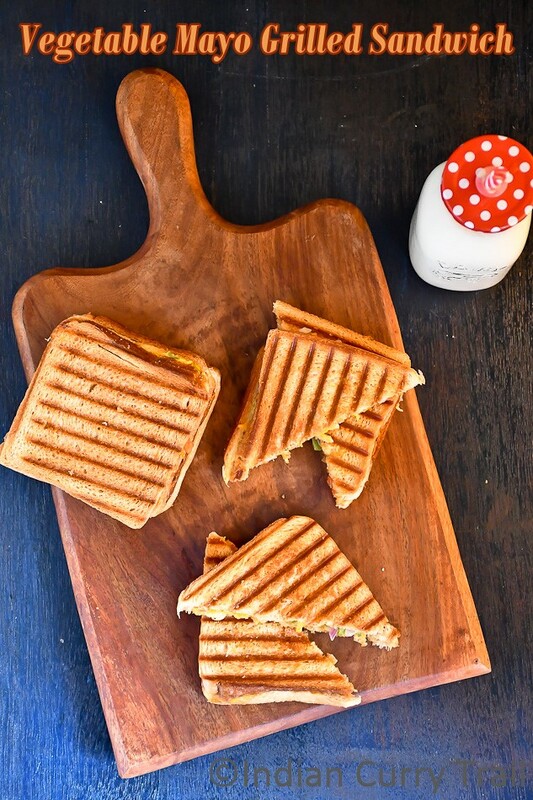 Instead of grill, one can toast the bread slices on the stove top by using the dosa pan. 8) Take it from the grill, slice it and serve hot. It can be served as a breakfast or as a snack. Generally served with tomato ketchup. 1) Vegetables can be customized according to personal preference. 2) Instead of plain mayo, one can use the flavored one as well.